The University of San Diego currently supports three methods of file sharing. Each method has various benefits and you can request or use the one that best suits your needs. 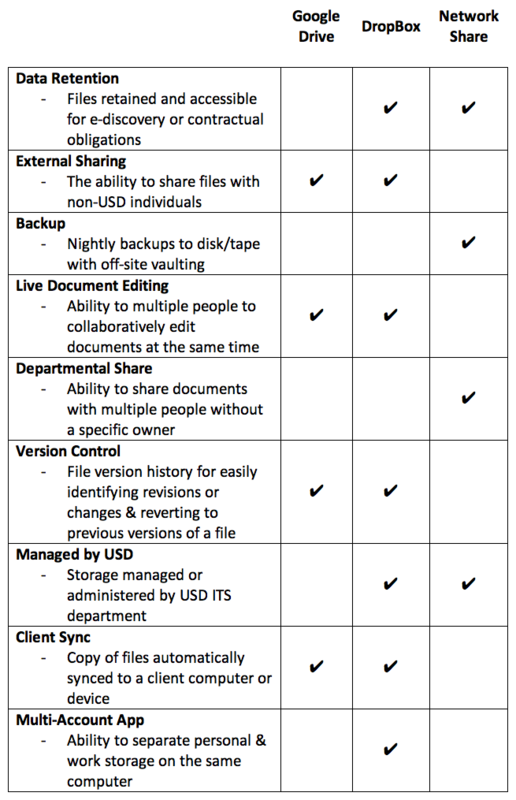 DropBox – USD has DropBox for Business licenses available for an annual fee. DropBox has unlimited storage and USD has limited administrative control of our accounts. Google Drive – Google Drive is included in the G Suite of applications and is available for free to all USD faculty, staff and students. Drive has unlimited storage and USD has no administrative control of our accounts. Network Share – All faculty & staff at USD are entitled to 20GB of storage on our networked file server. Departmental shared folders are also available upon request. What happens to my files if I leave USD? Google Drive: If you are a student, your Google Drive account will remain intact and nothing will change once you graduate. If you are a faculty/staff member and an alumni, you may or may not retain access to your files depending on the needs of your department. If you are a faculty or staff member and NOT an alumni, your Google Drive account will be deleted and all of your files will be lost. DropBox: Your DropBox account will become “suspended” and you will no longer have access to the files. Your supervisor will need to designate a new owner and ITS will transfer ownership of your DropBox account and its files to the new owner. Network Share: Network shares are independent of any specific user. The files will remain intact when you leave USD and anyone who previously had access will continue to have access.